In this video, I present the Green Plan Ireland study, which outlines how Ireland can transition from fossil fuels to 100% renewable energy by the year 2050. The event was kindly hosted by the IIEA in March 2016. 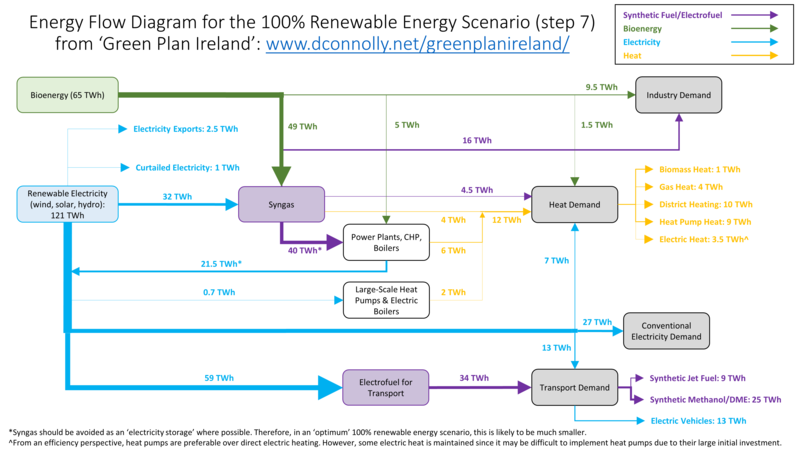 The energy flow diagram provided here represents the flow of energy in the 100% renewable energy scenario proposed in Green Plan Ireland. As emphasised in the study, this should be viewed as one potential 100% renewable energy scenario for Ireland and not as an ‘optimum’ scenario. An energy flow diagram is available for a more optimised 100% renewable energy scenario from the CEESA project, which focused on Denmark (see Figure 3.13 on page 57 of the main report). CEESA was a five-year research project involving more than 20 researchers across 7 different university departments or research institutions in Denmark, so the analysis is much more detailed than in Green Plan Ireland. Therefore, this energy flow diagram is over simplified compared to reality so that it is easier to understand, both in its design and its presentation. A detailed eneryg flow diagram is provided for the synthetic/electrofuels explicitly in the Green Plan Ireland study and in this journal article. The Irish Wind Energy Assocation (IWEA) is committed to the promotion and education of wind energy issues and plays a leading role in the areas of conference organisation, lobbying and policy development on the island of Ireland.